This entry was posted in Found on the Internet, Gardening and tagged container gardening, gardening, lead, urban gardening, vertical gardening. Bookmark the permalink. “… urban soils are often compacted …” True, but you can use worms and/or certain plants that sprout roots that soften and aerate the soil as an initial measure if you are not in a hurry. If you apply soft tactics as this and can afford to wait, say, two years, not only will you have ideal top soil but likely will have an idea if the soil is so contaminated that it repels such organic “helpers” which then should give you reason to think again. Thanks for the comment. This is true. Worms can help alleviate compaction issues and create “macropores” through which plant roots can grow. Incorporating organic matter along with adding earthworms can also help improve compaction by both providing food for the worms, and by helping to build up soil structure over time. I’d be wary of relying on earthworms as indicators of contaminants though. They can concentrate some contaminants in their bodies without adverse effects, and then move those contaminants up the food chain (like DDT for example). There are also other plants that can be used for till the soil, such as “tillage radishes”. Be careful using tillage radishes in urban areas though, because they tend to collect sulfur in a small area, which eventually stinks like rotten eggs and can be mistaken for a natural gas leak. It seems really important to make sure that the soil on your property is healthy enough to plant a garden. You made a very good point by stating the importance of checking the amount of contaminants in your soil. Any toxins can have an impact on how well your garden grows. What are your thoughts about split spoon sampling versus down the hole sampling? I would like to choose the best soil sampling method to grow a garden in my yard. Thanks for the comment. Regarding toxins, in Urban vegetable garden the bigger concern is toxicity to those consuming the veggies – especially in regard to lead. I just want to make that point clear. Toxicity might cause some yield issues, but in urban gardens I’d be more worried about heavy metals. In regard to soil sampling methods – the exact method doesn’t matter so much as does the technique. You want to make sure that you take a representative sample of the soil. To do that, take multiple samples from throughout the garden area. Make sure each sample is equal in size to the other sample locations. For the method, a clean shovel or trowel will work just as well as fancy soil sampling equipment as long as the sample size is consistent and that multiple sample locations are used. I would recommend using a small spade (aka sharpshooter) or shovel and dig down to 6 or 8 inches. Be sure to use a shovel that has been cleaned well first. Place each sample in a clean bucket (that has never been used to hold fertilizer). Once the bucket is about half full, mix it thoroughly. Then take a subsample of this well-mixed soil and submit it to a soil testing lab for further analysis. There are lots of good videos on YouTube that show how to take garden soil samples. Watch a few that came from respected sources, such as university extension offices, if you want some more help on sampling strategy. Also, the soil testing lab to which you will be sending your samples should also have a pamphlet or video describing how to take a representative soil sample, and how to prepare it for shipping and analysis. Good comments on treated wood use in raised beds. Old rail road ties have been used in raised beds and low retaining walls. Ties usually have been treated with heavy duty preservatives. What contaminants could we expect to find that has leached into the adjacent soil? 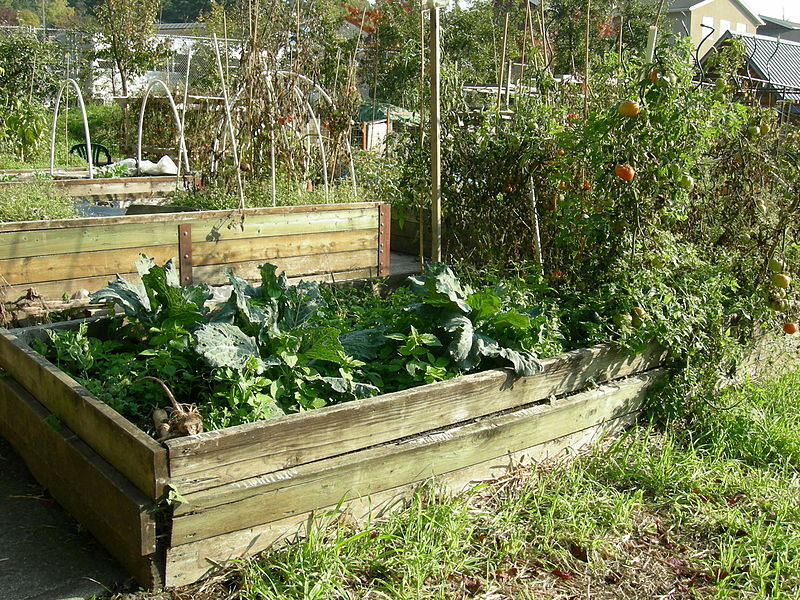 I have a raised bed like this and I use it for ornamental annual flowers and not for food production. Am I being too cautious?